BRUSSLES/TRONDHEIM—Input-intensive crop monocultures and industrial-scale feedlots must be consigned to the past in order to put global food systems onto sustainable footing, according to the world’s foremost experts on food security, agro-ecosystems and nutrition. Frison explained that some of the key obstacles to change are about who has the power to set the agenda. “The way we define food security and the way we measure success in food systems tend to reflect what industrial agriculture is designed to deliver - not what really matters in terms of building sustainable food systems,” Frison stated. The experts concluded that a fundamental shift toward diversified agroecological farming* can deliver simultaneous benefits for productivity, the environment and society. *Diversified agroecological farming refers to models of agriculture based on diversifying farms and farming landscapes, replacing chemical inputs, optimizing biodiversity and stimulating interactions between different species, as part of holistic strategies to build long-term fertility, healthy agro-ecosystems and secure livelihoods. Organic agriculture often reflects these principles, but organic certification does not guarantee a holistic diversified approach. Photo on front page: While so-called “Climate-smart Agriculture” is designed to expand carbon markets and serve the interests of agribusiness and the financial industry, the practice of agroecology boasts a scientifically valid response to climate change and is designed for the purpose of rebuilding decentralized, just and sustainable agricultural systems. Source: UCSC farm rows/ Flickr. 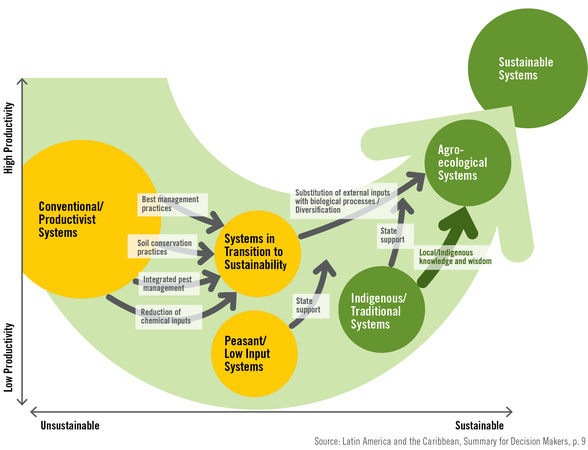 Image on this page: Graphic of the transition to agroecology, Source: IAASTD Latin America and the Caribbean (LAC), “Transition to Sustainable Systems. Summary for Decision Makers,” p. 9. IAASTD/Ketill Berger, 9 UNEP/GRID-Arendal.